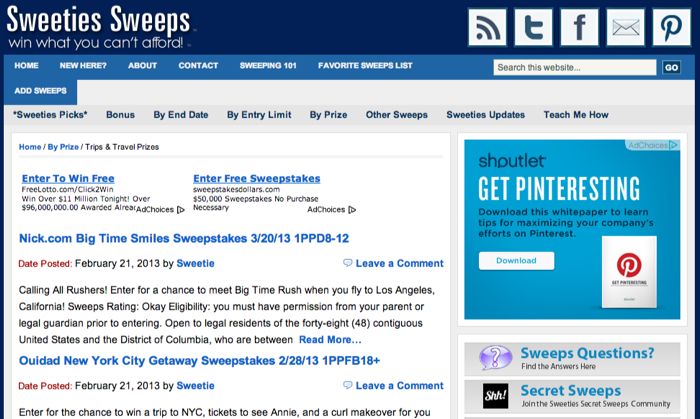 Sweeties Sweeps is a promotional directory that has different databases for blog giveaways and larger sweepstakes. The site is run by Wendy, an avid sweeper who writes about how she’s a truck, a $25,000 vacation and tons of other prizes. Her hobby then translated into the construction of SweetiesSweeps where anyone can add and enter promotions. The setup of the website is quite straightforward with listings of promotions by category, end date and type of promotion (blog giveaway versus sweepstakes). The website also categorizes sweepstakes by entry limit (daily, weekly, once per person, etc.). The layout can be a bit overwhelming when you first visit the website but once you’ve clicked around a bit it becomes navigable. There is also a ‘Sweeties Secret Sweeps’ option for entrants. By paying $25, via PayPal or credit card, per year you can join this site to gain access to local promotions which are only open to residents of specific cities, counties or states. These sweepstakes tend to have less entrants, hence each entrant has a higher chance of winning. SweetiesSweeps offers the ability to add your promotions to the site for free, selecting whether to include it within the blog giveaway category or the sweepstakes database. Not all promotions that are submitted for free are posted to the website. You can pay $75 for one week and $50 per additional week to guarantee that your promotion is included on the website’s homepage. The paid version is said to reach 5,000 to 10,000 visitors per day as well as being Tweeted once to 12,400+ followers and added as a Facebook post to their 22,000+ fans.